Bokashi Kitchen Composter of the Future? Bokashi composting comes from Japan. Professor Teruo Higa developed it and it is now being promoted around the world as an effective and practical solution to kitchen waste recycling. So what is Bokashi composting and what is special about a Bokashi bin? The Bokashi kitchen composting process uses good old-fashioned microorganisms such as yeasts and actinomycetes to work. Food waste is worked on by five different types of microorganisms. The particular mix of microorganisms used is called "Effective Microorganisms" (or EM) by the company which promotes Bokashi worldwide. The process started by these microorganisms is akin to pickling. It only takes about two or three weeks to get to the point where the pickled waste can be safely put into the ground or added to the compost heap. It can't be left on the surface of the ground as it will still attract vermin.
. Some local authorities in the UK also have them at subsidised prices. There is no horrible smell of decomposition to worry about. Most compost heaps can be a bit of a problem - at least if you want to add kitchen waste. The vermin quickly get scent of what's on offer and, unless your compost heap is particularly well secured, they are in and tunneling away before you can say "rats"! The pickling process of bokashi composting takes place in a sealed container so vermin are not a problem. A Bokashi kitchen composter is also mighty quick! About two to three weeks is all that's needed for the various microorganisms to do their work. It's also quite convenient in that you can include all kinds of kitchen waste foods, even including left-over meat scraps. For me this is the best thing about it because it has long been a source of unease that after family meals we are contributing bio-degradable items to landfill. There they just give off gases uselessly for the most part - worse, they may also contribute to global warming. It's far better that these wastes should be composted at home where the nitrogen and carbon can be safely re-used. In Bokashi composting the fermentation process is anaerobic. This means that oxygen is not required for the process. It's important to keep the lid firmly on the Bokashi kitchen composter. When you add new material you add a small handful of the special bran, which is "inoculated" with microorganisms. 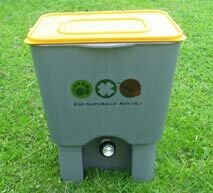 Using a Bokashi kitchen composter is simple. Just collect your food waste each day, Chop up any larger pieces so that the bran can be mixed in thoroughly. I find it's easiest to do this before adding the waste to a collecting bin, while it's still on the chopping board after food preparation. You need to drain off any excess liquids. So far, I find it's easier not to bother composting the tea and coffee slops with the Bokashi kitchen composter. That way there's no excess liquid to worry about most of the time. When you've collected a day's worth or so, just open the compost bin lid and put the waste in. You can include virtually all kitchen waste such as vegetable peelings, fruit waste, meat scraps, fish bones and coffee grounds. Add some of the bokashi bran and mix it around a little. . The bacteria, fungi and yeasts in the Bokashi Bran then kick-start the composting process. Because the micro-organisms are friendly ones the process is reasonably smell free. This makes it a lot easier to have the bucket in the kitchen. When the Bokashi bran is mixed in to the new layer of kitchen waste, tamp it all down with the paddle provided. Refit the lid securely and you are done, except that every day or two you need to drain some liquid off from the bottom of the Bokashi bin. Specially designed Bokashi kitchen composter buckets come with a drain guard and tap, so this is very easy to do. If you are not using one of these, you need some holes in the bottom of your compost bucket and you need to keep it in some kind of container or tray to collect the liquid. The liquid is produced as a by-product of the process. It's not a huge amount but it does need to be drained away. This liquid can be used to feed your plants and activate soil organisms, so it's all good! Just dilute it about 1:100 and put it in a watering can. You can also use it undiluted to clean the drains. It is supposed to digest scum and bacteria accumulating in drainage pipes. When your Bokashi bin is full leave just set it aside to finish digesting for about 1 - 2 weeks. This is when you start using the second bin in exactly the same way. As the bin does not smell (much - there's a bit of a yeasty whiff when you open it) there is no real need to evict it from the kitchen but you can put it somewhere more convenient such as a garage or shed to finish, if you prefer. Bokashi - the future of composting? So far - and I'm a newbie to the process - I've found Bokashi composting pretty easy and user-friendly. I've added the first lot of compost to my experimental compost pit with no problems. It does not appear to be attracting vermin or flies. Now to see how useful it is for fertility. If you don't fancy the whole process but like the idea of the compost tea, you can buy a compost tea maker which plugs in and heats up a mixture of Effective Microorganisms and molasses. It produces a yeasty brew which you then dilute to put on your plants and soil. It does not smell quite the same as the liquid which comes off the Bokashi compost bin but it has much the same effect. So far, I'm impressed by Bokashi composting and I think it will be a great asset both for domestic use and for schools and other public institutions that want to green-up their waste disposal. You can buy large scale Bokashi composting units for horticultural use too. If you aren't convinced of the benefits of a bokashi kitchen composter, it's still worth having an ordinary one of course. Your organic kitchen waste can be kept out of landfill and can provide real benefits for your garden's fertility.